CyberGhost is an all in one solution to protect your devices ranging from smartphones to desktop computers for safe and secure Internet surfing. It provides hundreds of worldwide servers to choose from for blazingly fast speed and advanced encryption protocols. Recently I started noticing that their service is not as fast it was in the past, and there are some connectivity issues as well. 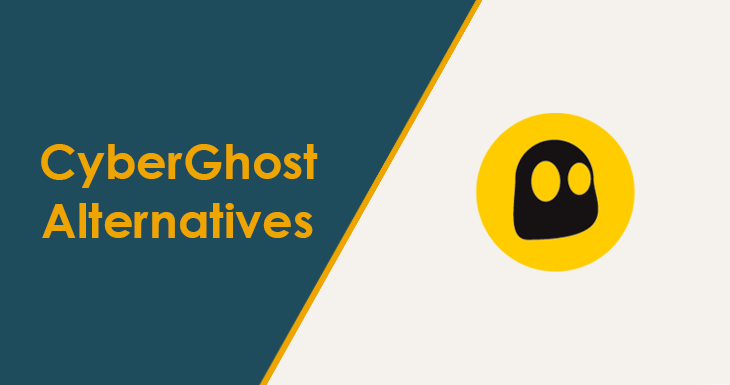 If you’re also facing the same or different problems, then make use of this list of CyberGhost alternatives and pick the most suitable VPN according to your needs. As you’re interested to know what are the most related and similar softwares like Cyberghost VPN, So I don’t think you might like to read an overview about it 🙂 Let’s jump straight to the real part. 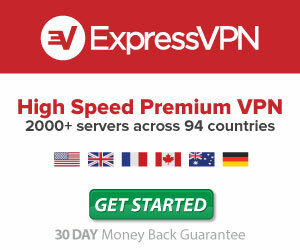 ExpressVPN is a premium platform so they don’t offer any free plan however you can try for a month as the company accommodates a 30 days money back guarantee. It was launched in 2009 and a British Virgin Islan based company. They self-claim to have the fastest VPN service on earth and indeed are. Though it’s a prime service but quality comes with the price, and it’s something they deliver. Unlike most vpn providers, ExpressVPN also offers 24/7 customer support via live chat. You might know that commonly you don’t get live support, but ExpressVPN went one mile ahead in this regard. As one of the top alternatives to CyberGhost, they have a giant network of 1700+ global VPN servers across the globe which are optimized for lightning fast speed and cutting edge security for never compromising your identity and logs (they don’t keep records). They encrypt your activities with 256-bit AES protocol along with DNS/IPv6 leak protection from hackers and surveillance. Killswitch and split tunneling are also added for further safety. You are not restricted to browse, stream, or download anything through ExpressVPN servers without exposing actual IP address. ExpressVPN can be installed and used on almost all devices such as Android, iOS, Windows, Mac, Linux, Internet Routers, Chrome, Safari, and Firefox browsers. Its software client supports dozens of devices and comes with easy navigation to provide a pleasing experience. Instant 24/7 support is always there for help via live chat and email to resolve your issues on priority basis. IPVanish is one of the best Cyberghost VPN alternatives to browse blocked websites and surf geo-restricted services across the world. It allows browsing through thousands of secured IP addresses and dozens of servers located in more than 60 countries. They protect the users’ identity and actual location through 256-bit AES encryption which makes it sure not to let anyone track you. IPVanish doesn’t take traffic logs like many other so-called best VPN providers. So, it means maximum security, no-tracing, and freedom to choose from hundreds of VPN servers (1000+). Proxies and VPN softwares usually influence the Internet speed when activated, but it doesn’t happen with IPVanish. Their premium platform delivers faster experience without slowing down your data connection. Just like Cyberghost, it also supports multiple devices such as Windows PC, Android, iOS, Linux, Routers, etc. You can use on 5 devices simultaneously rather than sticking with one. You can choose from OpenVPN, PPTP, and L2TP/IPsec protocols. Some companies restrict torrent downloading. However, IPVanish allows downloading unlimited data which means no bandwidth limits. Besides, you are permitted restriction-free server switching. It’s a paid service so you’ll have to become a paid subscriber to take all full benefits. Nevertheless, they offer 7-days free trial to let users test their quality before paying for any premium plan. They provide 24/7 customer support to help you round the clock for 365 days. Similar to CyberGhost, TunnelBears also a freemium VPN software that offers free as well as premium services at reasonable rates. They provide a minimalistic and user friendly VPN client interface which consists of a one-click quick activate/deactivate button for secured connection. One of the biggest cons with them as a free user is you only get 500 MB per month bandwidth which is insufficient for most of the users. But you can avail an extra 1 GB by sharing it on Twiter. No matter free or paid user, you get an outstanding and fast browsing experience. It doesn’t slow down your internet speed as some providers do. Free vpn services usually affect the speed even some paid software also drastically decrease it but thanks to TunnelBear’s advanced servers located in more than 20 countries. You get blazingly fast and robust encryption all around the world. Their premium plans are quite cheaper, allow unlimited monthly bandwidth and can be used on 5 devices concurrently to shield your privacy flawlessly. Not willing to pay any fees? No problem just sign up and make use of their free plan to encrypt connectivity through 256-bit AES protocol. The most staggering feature I like the most is “GhostBear” feature which assures the protection even in VPN blocked countries. It tightens the security layer of your online activities and makes less detectable for ISP’s, business, agencies, and governments. They offer user clients for all devices and operating systems including iOS, Andriod, Windows, iPhone, iPad, Chrome, etc. which makes it the best Cyberghost alternative. Just install and sign in your account, select the country and press the activation button and you’re good to go. It’s dead simple to deliver the seamless experience and designed for effortless navigation. The support service is accessible throughout the whole year to fix the problems that you may rarely face. NordVPN is another top-rated Cyberghost competitor thumbed up by many well-known reviews websites such as BestVPN, BuzzFeed, Wired, BBC, and theGuardian, etc. They offer secured protocols and double data encryption technology that encrypts the data twice with strict zero log policy. They do not record any logs of your online activities which means total peace of mind no matter from where you surf the internet. So you can stream videos, access social media network, and browse censored websites anonymously by military grade encryptions. NordVPN has locations in 60 different countries and a whopping amount of 3131 servers around the world to deliver a ridiculous experience. All of their virtual servers optimized for P2P activities to download files blazingly fast without compromising identity. Futhermore, killswitch feature protects your IP address imperiling publicly while connectivity issues or service disruption. With that said, it still guards your device against prying eyes during disconnectivity. Their double encryption ensures DNS leak protection for added security. Plus, Onion OpenVPN, Anti DDoS servers, Dedicated IP addresses, and modern software interface with quick connect button makes it much easier to use. It is available for almost all devices and OS such as Android, iOS, Windows, Chrome, and Firefox browsers as well as routers. If you’re security conscious then choosing NordVPN would be a perfect choice for bulletproof privacy protection. VyprVPN is also an excellent service for secured Internet usage with the help of Chameleon technology. You can implement VyperVPN on all of your machines tablets, desktop, and smartphones, etc. for a reliable and trustworthy security layer. Their Chameleon feature bypass VPN blockers and countries that don’t allow proxies or virtual private network to access censored content. Futhermore, for extra privacy security, you also get Nat FireWall option as well for enhanced encryption. They provide freedom of unlimited data transfer as there is no monthly bandwidth cap. So, the users can download unmetered files, stream videos, and watch their beloved TV shows across the world. Their advanced encryption technology never slows down your speed significantly but an unnoticeable impact that usually happens with almost every VPN. The company has more than 50 locations and over 700+ servers empowered by 200k+ global IP addresses. They support multiple protocols to help users choose the appropriate one such as L2TP, PPTP, OpenVPN, etc. VyprVPN mainly focus on user privacy as they have a dedicated team of in-house engineers who innovate modern technologies and integrate them to deliver the leading edge security solutions for businesses and individuals. Their network is highly optimized for lightning fast speed and deliver 100% uptime. Software clients are available for almost all devices and 24/7 support team can out reached anytime whenever you need help. Regarding refund policy, the 3-day trial is given for test drive. You can purchase premium plans via PayPal, Credit Cards, AliPay, etc. Windscribe is also a prominent substitute when we talk about Cyberghost alternatives that offer bulletproof security and block annoying advertisements. It helps you unblock geo-restricted services and websites by masking your original IP address, so you can privately access all blocked stuff without revealing the identity. On top of that, their DNS leak measures never let anyone track your online activities. Windscribe also doesn’t trace you or create permanent logs but few records for necessary information. Do you love to watch Netflix but travel abroad quite frequently? In that particular case, you may like to know that Windscribe’s Windflix feature allow watching Netflix from anywhere around the globe. With the help of browser extension, just connect to Windflix location and you’ll be able to watch favorite shows and movies with fast buffer speed. They have a broad range of VPN server spots and right now incorporating more than 50 counties and 100 cities to provide outstanding user experience through AES 256-bit encryption with 4096-bit RSA key. Windscribe is generous enough to offer free subscription along with premium plans. You can take benefits from free plans as long as you like to with 10 GB monthly bandwidth, but paid subscription have no bandwidth limitation. As a free user, you get access to 10+ countries. No doubt, free VPN comes with limited features and support service, so it’s always recommended to choose a premium account for priority support and advanced security protocols. Moreover, companies eternally give preference to paid customers rather than free ones. Hotspot Shield working around for a while to help individuals and businesses protect their online privacy. It has millions of users taking benefits from their high performance VPN network. Hotspot Shield is quite popular among free VPN softwares because of fast browsing speed and that’s why users who live in countries where HSS is blocked often look for Hotspot shield similar softwares to watch desired TV plays and open geo-restricted websites. At the time of crafting this list, there were 500 million peoples who downloaded it worldwide to open blocked sites and services. Unlike TunnelBear, it doesn’t require signup process to use. All you need to do is download and install the app according to your device nature. It’s available for all the dominant OS and devices including iOS, Android, Mac, Windows, and Chrome, etc. There are some constraints in the free version such as limited daily bandwidth and annoying advertisements. You can choose from a number of servers to stream and enjoy area restricted media or censored content through an untraceable encrypted protocol. Same as Cyberghost, it also presents a bunch of servers to surf the internet securely worldwide. Hotspot Shield preserves the user identity for anonymous web browsing. It provides an encrypted VPN tunnel to hide your visited sites, transactions, and downloaded files from snoopers. You can bypass firewalls and ISP’s restrictions to access required stuff on all of your devices including mobile, tablets, and desktop, etc. All in all, if you want to have a free VPN solution then must give it a chance. PureVPN is also an excellent alternative to CyberGhost for peace of mind surfing as they shield your privacy with 256-bit encryption protocol and allow unlimited data transfer/bandwidth. They also include “kill switch” feature to keep your devices and information secure during connection disruption. PureVPN packed with a bunch of great features and multiple protocols (PPTP, SSTP, IKE, L2TP, OpenVPN-UDP, and OpenVPN-TCP) such as split tunneling help you access a specific data through VPN and the rest from your ISP. So, which thing make it the top alternative? Just like its competitor, they also have a wide array of VPN positions, countries as well as servers. Their VPN network covers more than 140 countries, 180 global locations, and whopping 750+ online instances to deliver the fastest speed regardless of geo-location. It provides the high-speed browsing and video streaming experience. Plus, a very professional team empower PureVPN network to deliver guaranteed 99.99% uptime. They have own servers rather than relying on 3rd parties to ensure maximum privacy. You get apps and user clients for major platforms (20+) including Windows, Mac, Android, Linux, iOS, etc. and allow 5 simultaneous logins with a single account. They allow access to all servers and unlimited switching without any plans barrier. When it comes to customer support, similar to Cyberghost, 24/7/365 available live chat round the clock will fix your problems. Summing it up, you must give PureVPN a try at least once as the company has 1 million+ satisfied customers. ProtonVPN is developed by the same people behind ProtonMail, a well-known email service for high security and privacy protection. They are one of the few firms that stand in the first row when it comes to Internet freedom and user privacy. And the primary reason to introduce ProtonVPN was delivering a high level of security for all users who surf the internet. They offer Swiss-based VPN service with strict zero log policy as well as never sell your data to third parties. As the company’s main focus is rock solid security, so you don’t have to worry while using public WiFi, home, or office network. It sends all traffic through the encrypted VPN tunnel and defends against any incident. They use Ciphers and Perfect Forward Secrecy to avoid traffic capturing and decrypting later, no matter if the encryption key gets hacked in future. ProtonVPN also allows downloading torrent over VPN network without any bandwidth cap. Additionally, P2P support also included for fast downloading speed. Compared to Cyberghost, they have less supported locations and servers but renders blazingly fast speed when connected to the nearest server. Right now, ProtonVPN has 112 servers, 14 countries, 155 Gbps capacity, and the tighten encryption protocol of AES 256-bit with 2048-bit RSA key and HMA with SHA256 for message verification. DNS leak, kill switch, Onion sites access, and 10 simultaneous devices connection are other perks. The softwares clients are available for Windows, MacOS, Linux, Android, and iOS with a modern interface which looks just awesome. There are total four plans from which one is FREE allows 3 countries and 1 device, but you’ll get slow browsing speed. The basic plan starts at $4/month and can be utilized on 2 devices. Their professional support can be approached anytime but via email. ProtonVPN offer beyond the industry standard 60-day money back guarantee. It’s JUST AWESOME. OKFreedom is a freemium VPN similar to Hotspot Shield and TunnelBear to enjoy anonymous browsing through various countries. They offer both free and paid subscriptions with unlimited switching, restriction free speed limits, and access via 19 global locations. It hides your IP address and masks with private one to enable the users to access regionally, or country restricted data. So, you can watch TV shows and program across the world. They have highly encrypted servers which makes tracing much difficult thus avoid from advertisers to track your online activities. You might know that when companies get your analytics data, they bother you with advertisements but thanks to OkayFreedom’s robust security measures. The major con as a free user is you get a tiny amount of 500 MB bandwidth per month which is JUST insufficient. It’s only suitable for limited use, but high-end users who research on a daily basis will definitely require a premium plan for uninterrupted service. In term of usability, you don’t get too much as it’s only available for PCs right now. So, it doesn’t support iOS, Mac, Android, etc. at the time of writing this. Regarding pricing, OkayFreedom offer cheapest VPN plan but only usable on one computer. Personally, I would like to choose Cyberghost’s free plan rather than going with this one. Because you can use it on multiple devices like PC, Mac, Android, etc. at zero fees. And they also provide live chat facility as well. However, solely Windows-based users can buy OkayFreedom premium without any doubt for quality services. Online privacy is something that we all want to get at its highest level to secure our online activities, personal information, and passwords. And this is where a Virtual Private Network or VPN software come into the game to rescue us and protect all of our data via encrypted protocols. These protocols disguise your actual IP address and encrypt information like username, password, email address, etc. and guard against hackers and evil eyes. It is highly recommended to use a VPN software instead of proxies because they are less protected and your ISP provider can sneak peak on your online activities. Already using a VPN software and looking for its substitute due to slow speed, connectivity issues, or anything less, I hope this Cyberghost alternatives and competitors list will help you find the right service.